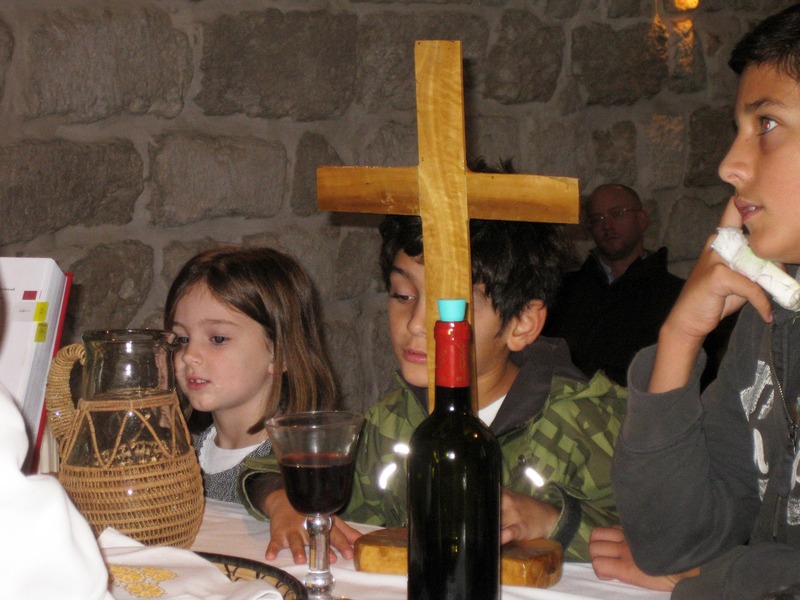 Last week after church we accidentally broke our favorite communion chalice. It fell to the floor with pieces of broken glass and drops of red wine scattered everywhere. Every Sunday we hear the words broken for you in relation to the bread that we share as a symbol of Christ’s broken body for our broken world. Now I can say it in relation to the cup and the wine, Christ’s blood broken and shed for you in the brokenness of our lives and for our whole broken world. Here our favorite clear glass chalice sits in the center of the altar next to a bottle of Crem-isan wine-- during a first communion class at the Lutheran Church of the Redeemer. We really liked that old clear glass chalice because we could see the rich deep red color of the wine, the port wine that we always buy from the Cremisan Monastery on the northern slopes of Beit Jala just next to Bethlehem. 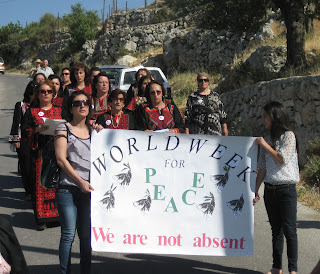 Back in 1995-96 when Gloria and I lived in Beth- lehem, we would take Sunday after- noon walks out to Cremisan, a full five-kilometer walk up the steep Beit Jala hills, and, of course, another five kilometers back. Yet it was worth it to experience this idyllic setting with terraced vineyards and olive groves sloping down the hillside and down the valley heading west. This idyllic scene has existed throughout the generations since the Salesian Brothers had come from Italy in 1885 to build this monastery with its school and winery on the ruins of an ancient sixth century monastery. Each Sunday there would be Palestinian families enjoying the shaded monastery grounds for picnics, and young boys playing basketball on the playgrounds and people like us coming to taste the red Cremisan wine. Today things have changed. The idyllic picture is disappearing. 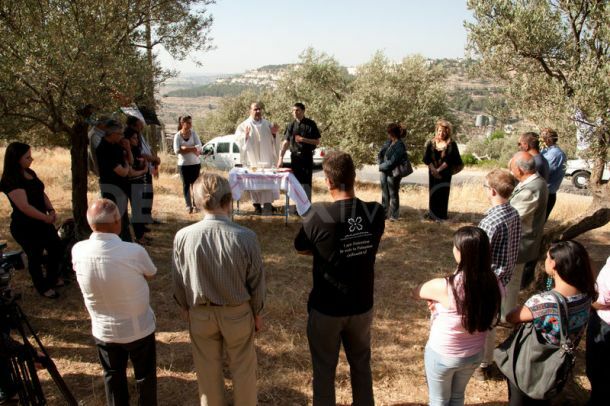 Late each Friday afternoon Father Ibrihim Shomali from Beit Jala's Catholic Church of the Annunciation holds an outdoor mass among the olive trees as a reminder of the brokenness of this world and of Christ's presence in situations like these. In the background is the Israeli settlement of Gilo now encroaching on Cremisan lands. 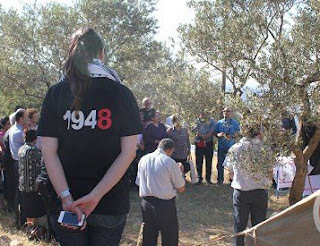 A few weeks ago when we gathered prior to the commemoration of al-Nakba, several participants wore tee-shirts with 1948 as a remembrance that two-thirds of the Christians in this land lost their homes and their land in that catastrophe fleeing as refugees. Our own Bishop Younan was invited to give the homily, describing how both his parents lost their homes and all their possessions at that time, finding refuge in another monastery, the Monastery of John the Baptist in the Old City of Jerusalem. The bishop witnessed how the Holy Communion always has assured him of Christ's presence in such situations of brokenness. 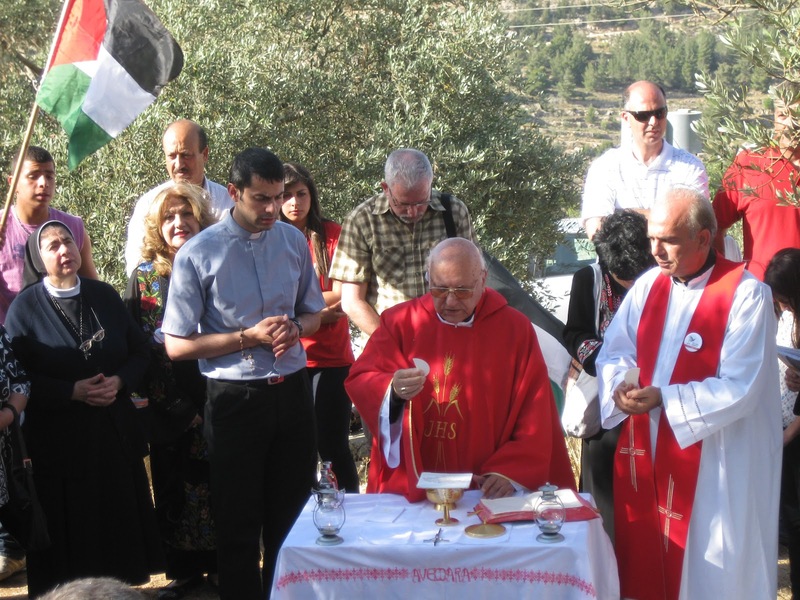 The Cremisan story is a reminder that al-Nakba is not just an event of the past but it is a description of the ongoing catastrophe for the Palestinian people. The maps below are taken from a recent BBC report about Cremisan--marked in the lower left-hand corner of the map. The dotted white line shows the boundaries up until the 1967 war--commonly called the Green Line, officially recognized by the United States, every other country of the world, and the United Nations as the limit of Israeli territory and the starting point for peace negotions. 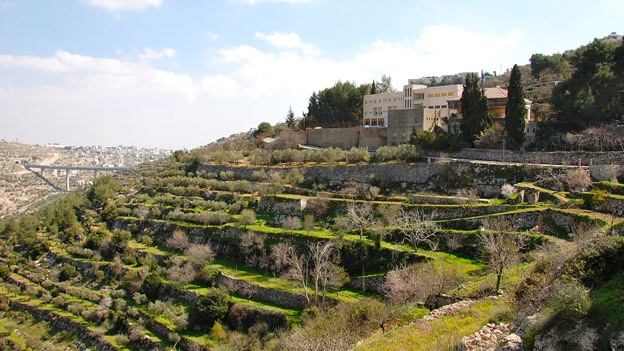 However, beginning in the early 1970s two Jewish- only settlements, Gilo and Har Gilo, were established on land conviscated from the residents of Beit Jala. Cremisan became sandwiched in between. The dark blue areas show other settlements clearly designed to take more and more land from Arabs surrounding Jerusalem--many of them Christians. 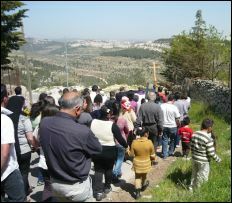 The next step came with the building of the Separation Wall--the route marked with red on the map--deep within Palestinian Territory and clearly designed to offer no room for further growth of cities like Beit Jala, Bethlehem, and Beit Sahour, and cutting off the Cremisan monastery, as well as Christian and Muslim families living in the surrounding area..
Today that idyllic picture has been replaced by the brokenness of the separation wall that climbs the hill from the Bethlehem check point. Fortunately, construction on the wall came to a halt when the Cremisan sisters appealed to Israeli courts on the grounds that the wall would separate their school from the students. 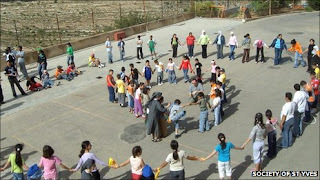 The court ruled in the sisters' favor, but the wall was then rerouted to cut straight through monastery property to divide the sisters of Cremisan and their school from the brothers of Cremisan and the rest of the monastery. 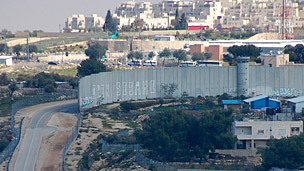 This aerial photo (from BBC) shows the route of the existing wall and the proposed route cutting Cremisan in two. 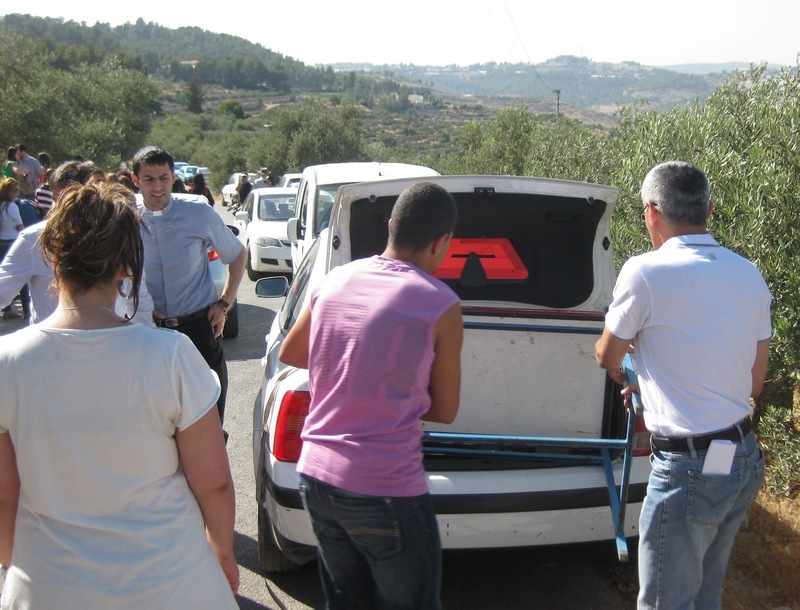 It seems obvious that its purpose is to provide room for the illegal settlement of Har Homa to expand toward Gilo--squeezing out Cremisan along the way, as well as homes of many Palestinian families. This is the continuing al-Nakba. On this weekend of Trinity Sunday when we wonder how it can be that "the whole earth is filled with God's glory" and the holiness of God raised to the third power (Isaiah 6:3), we are reminded of a story about Karl Rahner, one of the most prominent Roman Catholic Theologians of the 20th century whose crowning work was a systematic treatment of faith The Foundations of the Christian Faith. One day a university student told him that he had lost his faith and could Professor Rahner suggest a couple of books for him to read. Rahner’s response: You don’t need books. 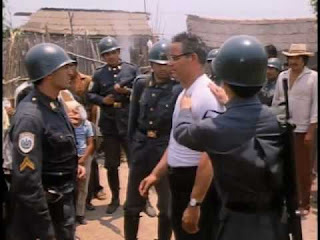 Go to Munich and work among the poor for a year and then we’ll talk. 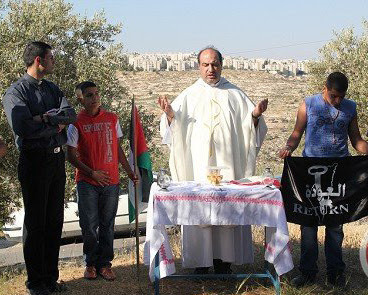 And so every Friday afternoon, Father Ibrihim Shomali celebrates the Mass in the olive groves of Cremisan where the separation wall is scheduled to break this already broken land even more. At 4:25 promptly, he drives up hauling a small table in the trunk of his car, which is set up in the olive orchard as a make-shift altar. for the season while a crowd of fifty, sixty, and sometimes over one hundred gather under the shade of the trees. Among them people who know the experience of losing homes, and others who have learned to see life from below, sometimes diplomats of various countries and clergy from different denominations. 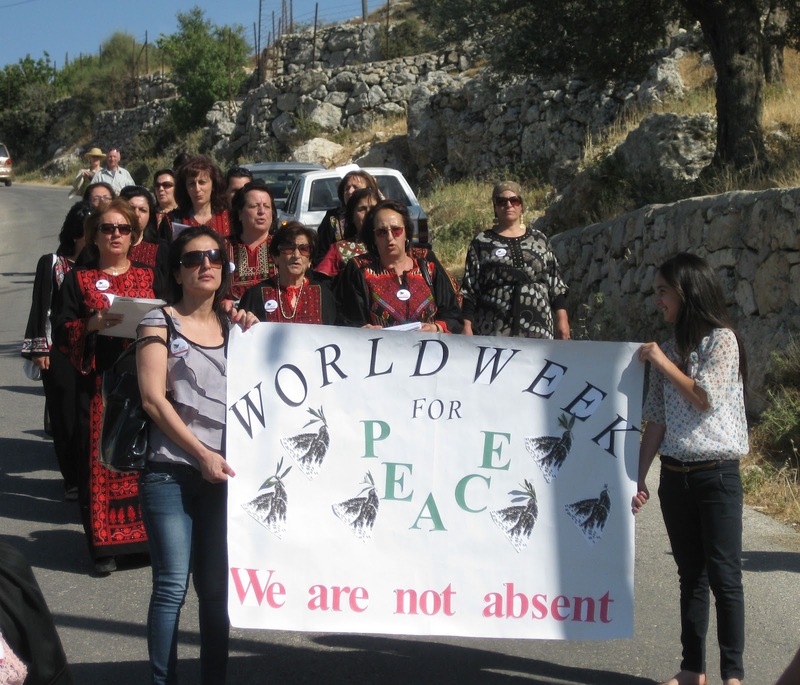 This week a women's choir joins us from the Catholic Church in Beit Sahour. 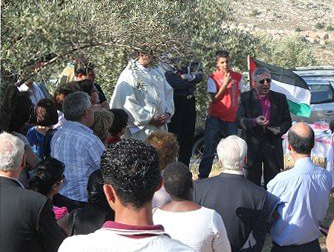 Click here to see a video of the Cremisan Mass. Michael Sabbah, retired Latin Patriarch, is the special guest. 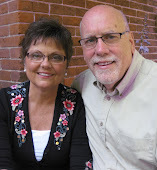 Christ’s body & blood broken for a broken world.